The Raven is a famous bird! It can be found in ancient legends and been, immortalized forever within the poetry of Edgar Allen Poe. One can see this bird all across the United States. It will build its nest in tall pine trees and occasionally in the sides of cliffs or in large rocks, preferring a secluded spot to nest instead of finding shelter among large flocks. Occasionally they can be found living near large human settlements during seasons when breeding is less popular. Pairs of Ravens can be seen as couples for their entire lives – they will remain faithful to a mate for much longer than the common crow or other species of bird. 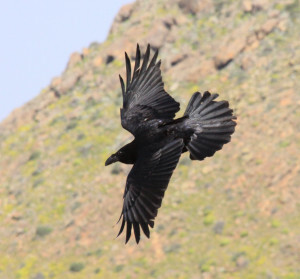 Despite its size, the Raven can move very fast and fly at very high altitudes, sometimes performing amazing acrobatic tricks in the air. They fly in slow flaps, using fewer flaps than most other birds but moving a bit faster due to their wingspan. 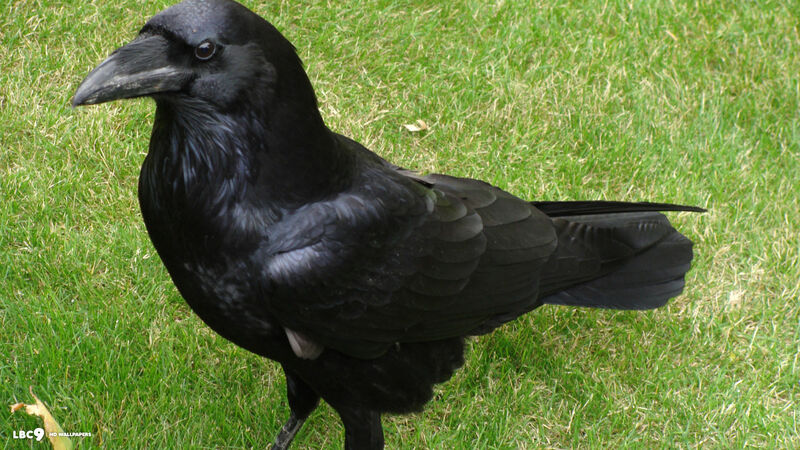 The Raven is a scavenger, feeding mostly on small animals such as lizards and toads, but they are known to feed on carrion and garbage as well. They are attracted to baited traps and dog food as well. They have been blamed for killing many larger animals, although it is more likely that they simply found the carcass. 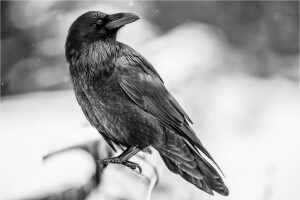 Ravens have also been persecuted for the destruction of crops on several occasions, mostly in Alaska where their presence is so prevalent that it permeates daily life to a staggering degree. Like other birds Ravens store food in their crops, but unlike many other birds, they are also reported to store food in their bills! One of the interesting things about the Raven is that it has a very wide range of calls, with over 30 different sounds being produced! 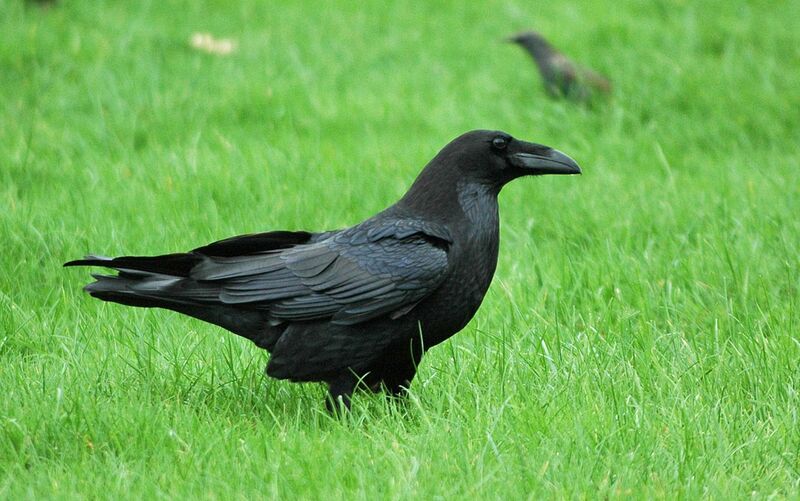 Ravens are very long-lived birds, with the longest-lived Raven in captivity lasting a full 29 years. Ravens in the wild probably live longer than this. 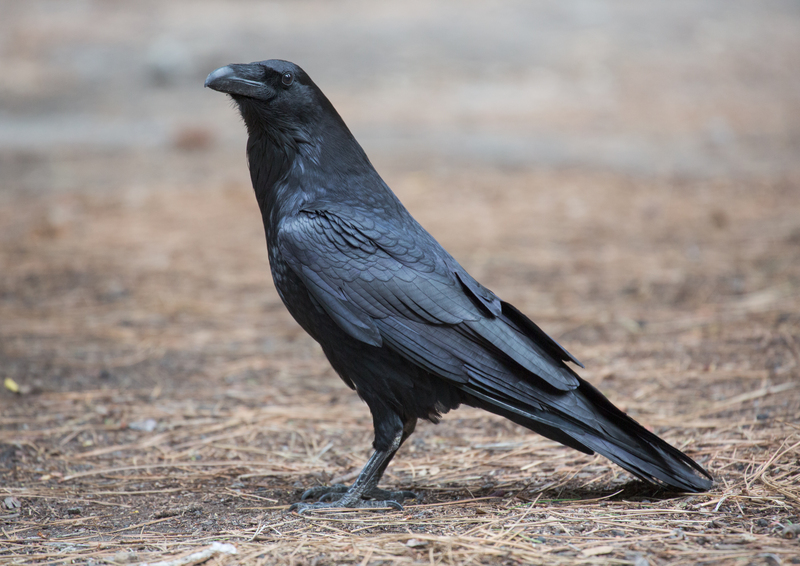 A common visage in many legends and classic stories, the Raven is midnight black from head to tail, except for its large, short beak. The Raven has distinctly triangular tail feathers, with some ruffled breast feathers complimenting its regal head. It looks very similar to the common crow, but is a full third larger than that bird. Males are considerably larger than females, weighing in at a full pound heavier on average than the females. The Raven is a very interesting animal to research. of the day. Several Eskimo tribes in Alaska have the Raven as a central part of their creation myths, with many of them seeing the Raven as the creator of the Earth and the Sun. 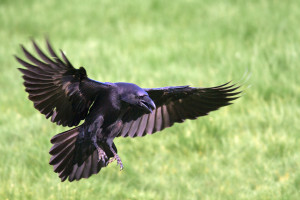 Commonly, Raven breeding season begins in January, with March bringing the advent of new mates. Females will lay a clutch of three to seven eggs, and the male will provide food and water, storing the latter in a special throat pouch. The male will provide the food to the nest while the mother tends to the eggs. In three weeks, the eggs will hatch, and a short four weeks later, the baby ravens will leave the nest. 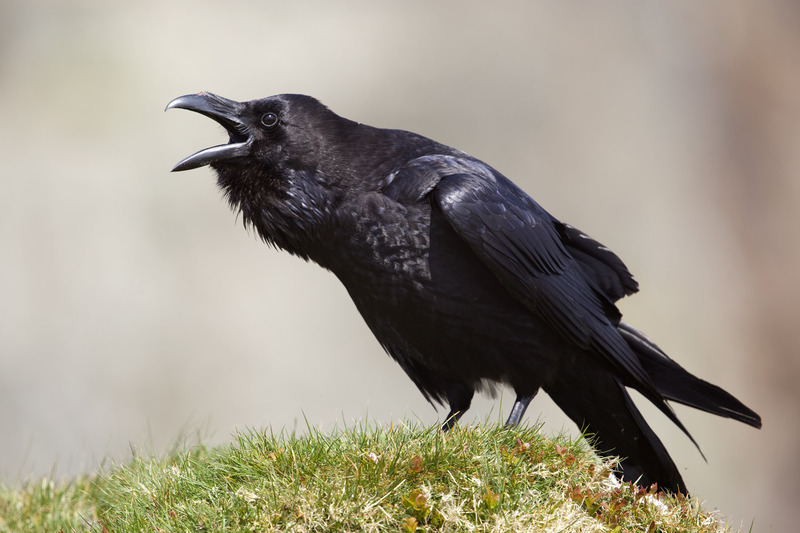 The average Raven in the wild will live between seven and nine years.